I tried a 557 Eotech on my Tavor. 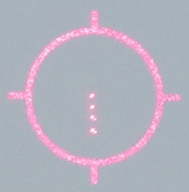 The 557's reticule is composed of a 65 MOA circle and 4 aiming dots. These dots are calibrated for the ballistic drop of .223 caliber ammunition. The dots are for 0-300 meters, 400 meters, 500 meters and 600 meters. The NV button: activate nigth vision compatibility mode (Gen I-III). 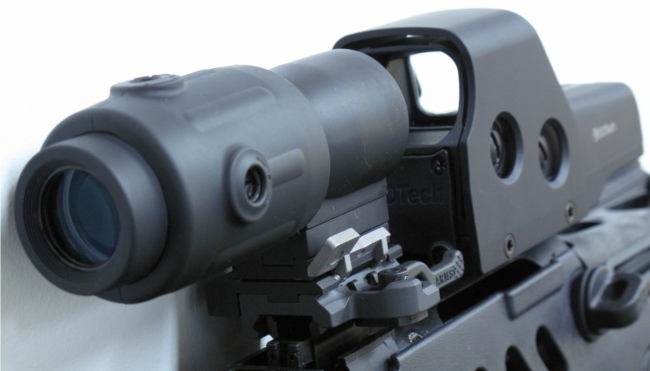 I also tried it with a 3X Eotech magnifier. This is the first generation model. It comes with a Flip-To-Side mount, built by Samson Manufacturing. I did not like this magnifier, nor the mount. 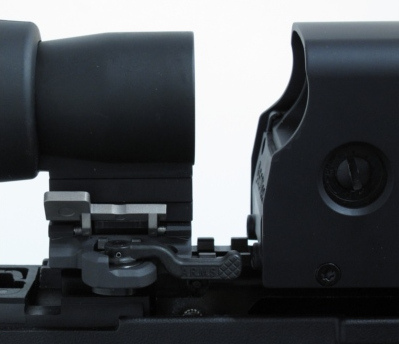 The mount is complicated since it includes the elevation and windage adjustments. I got rid of the first generation magnifier and got a G23.FTS 2nd Generation magnifier. It is a much better product. The mount has been completly redesigned and is rock solid. Adjustements are now internal to the optic. The only adjustment I will probably do in the future is to the mount thow lever. 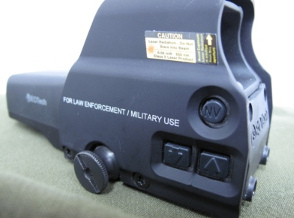 Since I am left handed, this lever points towards the 557 sight. This forces me to move the 557 forward one extra slot in the rail. It is not critical but rail space is limited on the Tavor. First generation magnifier is a poor product. Get the second generation! 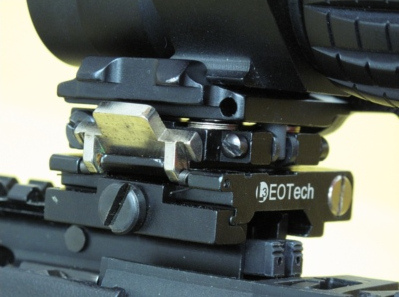 I am not a fan of the mounting screw on the EOTech. A thow lever like on the magnifier would have been better. 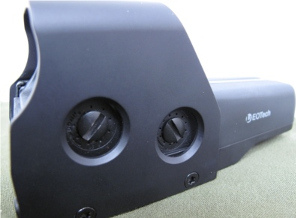 Or a quick detach lever like on the Meprolight.